The Book — With authentic sing-alongs, theme music, olios, blackout jokes, and a wealth of useful information about the melodramatic form, this resource will prove itself invaluable every time you put on a melodrama. The CD — All the music included in the book above is pre-recorded for your convenience! The 12 songs from the era are even included twice — once with lyrics and once without. In addition, you’ll find all the character theme music and best of all, an entire melodrama is performed from the master of ceremonies’ introduction to the olios. Actors new to this form of theatre can hear for themselves how a melodrama sounds! With this great tool, you can burn your own customized CD for every melodrama you produce. 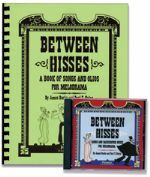 MELODRAMA BARGAIN PACKAGE — This package contains all of the best resources to help you stage an evening of melodrama: Between Hisses Book & CD and Melodrama: Beyond the Boos & Hisses on DVD all for only $85.00. Theatrical Makeup Kits contain expert components that produce professional results on stage. Ben Nye’s formulas apply velvety smooth, feel light and remain steadfast through the final curtain.